The AlterG® is the first FDA cleared therapeutic device that allows for precise partial weight-bearing exercise. Developed using NASA technology for exercise programs in training astronauts, AlterG® uses differential air pressure chambers to precisely lift the user from 100% to as little as 20% of the user’s calibrated body weight. Reduction in body weight can occur in 1% increments allowing for a gradual progression into full weight-bearing activities. 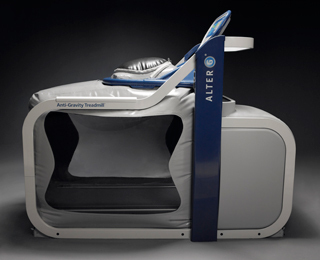 Experience the AlterG® difference for yourself and see why over 20 NCAA teams, over 20 professional sports teams and over 60 top performance enhancement centers, medical facilities and government facilities are using the Anti-Gravity Treadmill® in their training and rehabilitation programs. The Alter-G is available for use at a number of different time and rental plan options. For a complete breakdown of our pricing, including monthly memberships, 5-visit punch cards, 10-visit punch cards, and per minute punch cards, please call our office at 303-442-0355 or email Dr. Hansen at r.t.hansen@gmail.com . Additionally, Alter-G use may be covered under your insurance policy as part of your rehabilitation plan. If you would like to use your insurance for use on the unit, please inquire and we will check whether coverage applies. High Altitude Spine and Sport is the first clinic to have an Alter-G Antigravity Treadmill in the Boulder and Denver Metro areas that is open to the public. Call for your FREE 10 minute trial and experience how it feels to defy gravity.